Citation: Moore R, Whitlam G, Harrold T, Lewis N. The drinking habits of youth in NSW, Australia: latest data and influencing factors. Public Health Res Pract. 2016;26(4):e2641641. RM and NL wrote the manuscript, and GW and TH conducted the epidemiology and review. 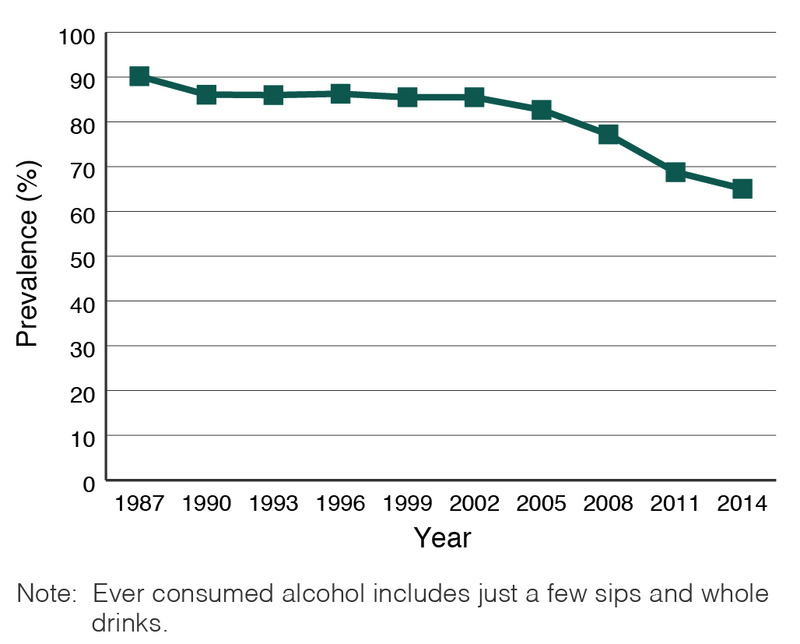 The New South Wales School Students Health Behaviours Survey (2014) reported a substantial reduction in students aged 12–17 years reporting that they had ever consumed alcohol, from 82.7% in 2005 to 65.1% in 2014. Similar downward trends are reported nationally and internationally. 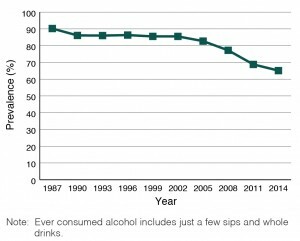 Although overall consumption is declining, national recommendations maintain that it is safest for young people to not drink at all; however, 17% of all young people in Australia consumed alcohol in the past 7 days, with 6% consuming at a significant risk of harm. The factors that influence young people’s uptake of alcohol are complex, including biological and broader social factors. This paper identifies some of the diverse influences on young people’s alcohol consumption, and policies and programs that support healthy behaviours. For young people younger than 18 years, not drinking alcohol is the safest option.1 National guidelines also recommend delaying the first drink of alcohol for young people aged 15–17 years. A promising picture is emerging in line with these recommendations, with clear trends of young Australians delaying their first use of alcohol and refraining from alcohol consumption entirely. However, young people who do consume alcohol are at high risk of experiencing harms because of excessive consumption of alcohol on a single occasion – that is, consuming more than four standard drinks on an occasion when they consume alcohol. It is important to note the different methods used to measure adolescent alcohol consumption, in particular, consuming a few sips of alcohol versus consuming a whole alcoholic drink. Although there are some concerns with the test–retest reliability of self-reported age of first drink8, some argue that this should not preclude it from being a useful measure to understand the association between early onset drinking and later alcohol-related outcomes. Livingston explores the phenomenon of increasing numbers of young people in Australia and internationally choosing to not drink alcohol.17 Livingston argues that waves of rising and falling consumption patterns (both in Australia and internationally) could be related to increases in alcohol-related harm, followed by increases in social concern and then subsequent reductions in consumption, which may be related to more restrictive parental alcohol supply to adolescents. Livingston also suggests other factors such as changing youth leisure patterns (e.g. increased time spent on the internet), and the increasing cultural diversity of Australia’s population may also play a role. The NSW Government regulates the sale and supply of liquor through the Liquor Act 2007. The Liquor Regulations 2008 has recently strengthened restrictions on hotels, clubs and packaged liquor through the NSW Liquor Amendment Act 2014, which imposed 1.30 am venue lockouts, 3 am last-liquor sales in the Sydney Business District Entertainment precinct and state-wide 10 pm closing time for packaged liquor businesses. Other alcohol-related harm minimisation measures outlined in the legislation include liquor accords, identity scanners and responsible service of alcohol training, although the evidence supporting these measures is not strong.20 In NSW, successive governments have also implemented stronger laws to reduce underage drinking through parental supply. The NSW Department of Education has an extensive drug and alcohol curriculum across the school-age population through the ‘Personal development, health and physical education’ curriculum. This includes the Crossroads program for students completing Years 11 and 12, which provides them with the skills to address significant changes and challenges, including drug and alcohol issues. Family-focused programs that support parents to reflect on their parenting styles and implement changes are also valuable strategies.21 The NSW Government’s ‘whole of family’ teams provide services to parents where there are multiple needs of mental health and drug and alcohol concerns. Other programs include Brighter Futures (targeted early intervention), Getting It Together (focus on vulnerable young people) and family support programs through Family and Community Services NSW and Family Drug Support. NSW Health has established the Drug and Alcohol Population and Community Programs Unit (DAPCP), with a dedicated focus on drug and alcohol population prevention and harm minimisation, including for young people (see Your Room). The DAPCP delivers programs for young people through peer-led approaches, schools-based interventions and family support. The DAPCP also delivers a multicomponent intervention for Aboriginal women and their partners, young people, and health professionals to raise awareness of the risk of alcohol consumption during pregnancy. Online interventions for risky alcohol consumption are a priority, and NSW Health has developed an alcohol program for the Get Healthy Information & Coaching Service, which delivers support to adults to reduce harmful alcohol consumption. Building the capacity of the system and prevention. The plan will also include an increased focus on family support, alcohol consumption in preconception and pregnancy, and community engagement. The recently announced NSW Government’s ‘drug and alcohol package’ has a strong focus on expanding access to youth-specific treatment services, improved support for families and an early intervention innovation fund. The DAPCP is also undertaking preliminary work on an Alcohol Harm Reduction Strategy for a comprehensive, integrated, multidimensional strategy to improve alcohol culture in NSW, including for young people. This NSW work will align with the Australian Government’s draft National Drug Strategy (2016–2025). NSW, Australian and international data suggest an increase in the proportion of students choosing to not drink alcohol and delaying initiation. However, there remains a substantial proportion of students drinking outside of recommendations, and a small proportion drinking at high-risk levels. The complex array of factors that drive the uptake of alcohol consumption are addressed through a comprehensive range of government programs that aim to better equip families to support young people through significant transition periods, and support healthy choices in regards to alcohol and other substances. Further research is warranted on the factors that are driving the downward trends to support a sustained effort by government and other agencies to maintain these trends, and deliver programs to the most at-risk young people who are still consuming alcohol at harmful rates. © 2016 Moore et al. This work is licensed under a Creative Commons Attribution-NonCommercial-ShareAlike 4.0 International Licence, which allows others to redistribute, adapt and share this work non-commercially provided they attribute the work and any adapted version of it is distributed under the same Creative Commons licence terms.